Oh I am so bummed! I didn't even notice that I had bought Volume 2 -- in fact, I didn't know there was a volume 1 until just now, when I read the preface where the author mentions "the very flattering reception" of his first book. Oh well -- I'm sure the first is very much like this one, and it's basically a collection of short stories, so I suppose in the long run it doesn't matter. "When the Yard sent out its first plainclothes police agents in 1842, the public felt uncomfortable with these 'spies' on the streets." "...in the disguise of plain clothes, police officers would be free to spy, incite and resort to deceitful means and corrupt practices, and in fact to engage in the kind of behaviour expected of continental police forces, particularly in France, Austria and Russia." "With the creation of detective departments in the country, and growing media interest in the activities of their agents, particularly working in London, more and more police detective figures entered fiction." "...came not just from the lower cost of books but also the social changes that occurred during the 19th century. The industrial revolution saw a concentration of the population in cities like London and Manchester, a growing middle class and higher literacy rates. The urban population had more leisure time to devote to reading while the invention of the train created a new demand for books to be read while traveling." 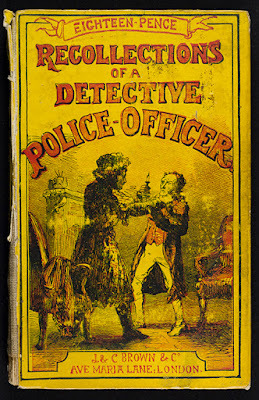 These yellowbacks were "the Victorian equivalent of a cheap paperback that you might read on the bus or on a plane." All righty -- now that we're done with historical part (trust me, I could wax on forever about this stuff so you're lucky) -- on to the book itself. As I said earlier, it seems as though I've picked up the second volume (my understanding is that there are three), but my guess is that the same sort of thing would be found in the others. The detective who solves all of these crimes is the fictional "Waters," whose first name starts with a C, as noted in the preface of my edition, which is signed "C.W." Waters here investigates eight crimes including blackmail, forgery, lots of bigamy (mainly due to greedy people who want to get their hands on an inheritance), arson, theft, murder and fraud. He takes us anywhere from stately British homes to farms to the slums, so there is a wide range of socioeconomic situations portrayed here. While once in a while we hear the results of the arrests Waters makes, there also seems to be better solutions than just legal justice in some stories when all is said and done. In the case of the story "Mark Stretton," for example, the evildoer is arrested but jumps bail and leaves the country, which Waters saw as "the wisest course" for the sake of the woman involved. This sort of thing happens more than once, and in the case of the bigamists, compromises for settling parts of an inheritance are happily made so that the innocent don't have to suffer. Waters doesn't mince words about the people in his adventures -- one woman who knowingly committed adultery and seeks to profit from it was called a "limb of Satan;" a wife whom one man felt compelled to marry for her fortune is labeled as a "shrew," and well, let's just say our modern sensibilities about ethnicity aren't respected here (nor should they be, really) as one character gets the moniker of "The Jew," complete with stereotype. 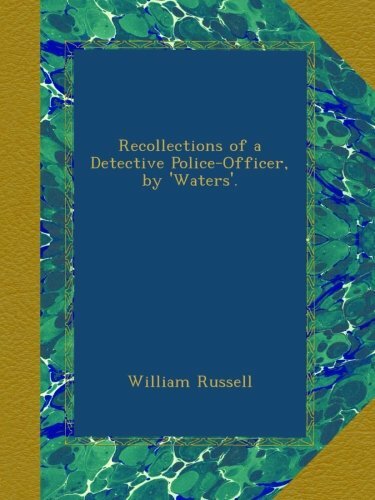 Most of what we learn about detective work is that it's a lot of watching and waiting until Waters is sure he has enough evidence against his quarry to make a case that will stick; he also enlists locals in his efforts as informants as well. He's no Sherlock Holmes, but the adventures are never dull. Out of the eight stories here, my favorite has to be "Fire-Raising," which is really the best whodunit of the collection. In most of these tales, we already know who is doing what to whom and it's just a matter of waiting them out, gathering evidence, etc., before Waters makes his move. Here the situation is a bit different, since the mystery is focused on who is the arsonist doing mayhem in a local farm district in Essex. The perpetrator is very clever, able to create a fire that won't actually erupt in flames for a matter of hours afterwards. I have to say that he set this one up quite nicely and I didn't figure out the who, for which I am quite grateful. Overall, it's a fun collection of stories that belongs in the library of anyone interested in the history of crime fiction/mystery, or anyone interested in Victorian crime fiction in general. For those who don't hoard books like I do, there are also a variety of places online for downloads. This book closes out the 1850s so onward I go.